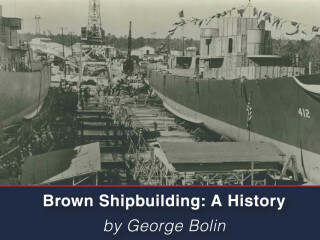 The Houston Maritime Museum will present the lecture Brown Shipbuilding: A History, presented by George Bolin. Brown Shipbuilding, a subsidiary of Brown and Root Inc., was established in 1941 at the junction of Green’s Bayou by owners Herman and George R. Brown. L.T. Bolin served as Vice-President and General Manager, and his wife and young son, George Bolin, participated in many of the 359 ship christenings honoring family members of veterans killed in the war. George will share personal memories along with the history of the company.